Here are two of our favorite Apple Recipes that make a great dessert for a Fall or Halloween Party. These are great for parties. 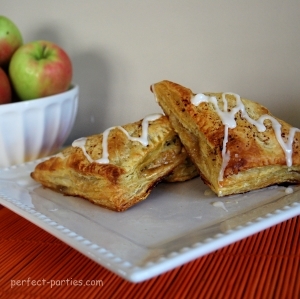 Drizzle the glaze over the turnovers and enjoy! We love using Pepperidge Farm pastry sheets. Melt butter in a large skillet over medium heat. Drain water from apples and place them into the hot skillet. Cook and stir for about 2 minutes. Add brown sugar, and cinnamon, and cook stirring for 2 more minutes. Stir together cornstarch and 1 tablespoon water. Pour into the skillet, and mix well. Cook for another minute, or until sauce has thickened. Unfold puff pastry sheets, and repair any cracks by pressing them back together. Spoon apples onto the center of each squares. Fold over from corner to corner into a triangle shape. Press the edges together to seal. Crimp with a fork. Place turnovers on a baking sheet, leaving about 1 inch between them. We like to use parchment paper to line the baking sheet. Bake for 20 minutes in the preheated oven, until turnovers are puffed and lightly browned. Cool completely before adding the glaze. To make the glaze, mix together the confectioners' sugar, milk and vanilla in a small bowl. Adjust the thickness by adding more sugar or milk if necessary. Drizzle glaze over cooled turnovers. If you don't use cut apples immediately, combine 2 tablespoons lemon juice in 4 cups of water in a large bowl and place sliced apples in the water to keep from browning. Drain water from apples before placing in skillet. We get everything ready before slicing and have not had to do this. They turn color slightly when cooking anyway. I use parchment paper to line the baking sheet for easy removal. You will have extra apples/sauce but it makes a great "fried apples" treat so I haven't cut back the original recipe. I'd also rather have extra than not enough and have to make more. I usually put about 3 slices of apple in each, if the syrup leaks a little from the pastries when closing, it will be fine. Add a little more cornstarch if you feel the syrup isn't thick enough. 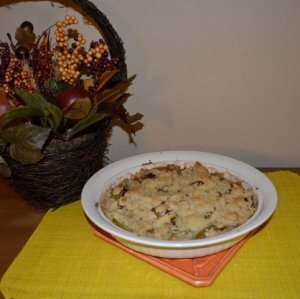 Another of our favorite apple recipes!! Perfect with a scoop of vanilla ice cream! Use Granny Smith or a combination of Granny Smith and another type of red apple. 4 cups sliced Granny Smith apples (approximately 2-3 apples)We often leave the skins on but you can peel them off if you prefer. Cool slightly before serving. Apples will be hot! Feel free to share your apple recipes with us!